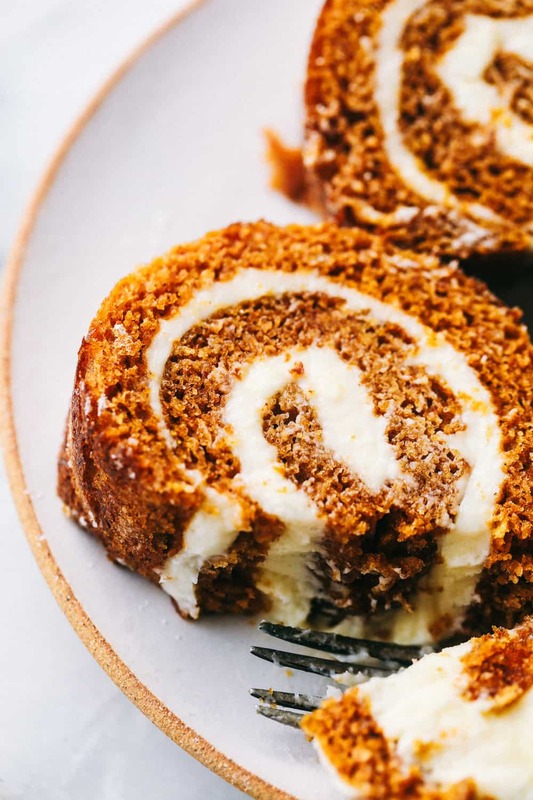 This is the World’s Best Pumpkin Roll! 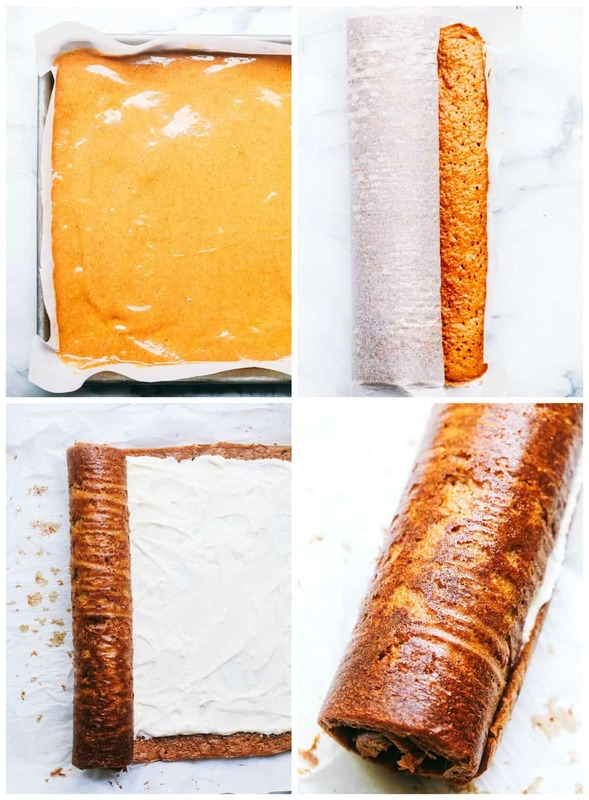 It is a perfectly moist and tender thin pumpkin cake that gets rolled up with a sweet cream cheese filling and dusted with powdered sugar. This is the easiest recipe you will ever make! 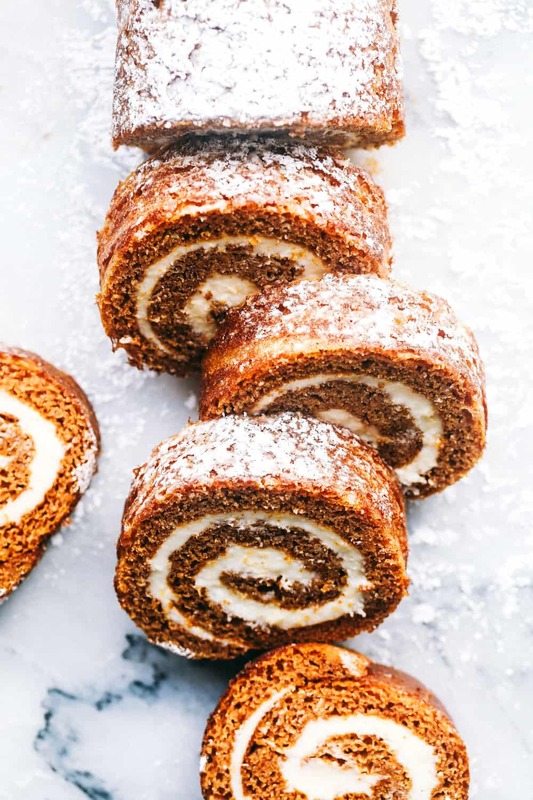 If you love pumpkin rolls just as much as we do, you should also try these Pumpkin Roll Bars. You GUYS. I am obsessed. This is my absolute favorite time of the year. Bring on all of the pumpkin desserts. I love pumpkin but I have a serious obsession with pumpkin and cream cheese desserts. Be sure to brace yourselves for some awesome pumpkin recipes that are coming right at ya. I made literally THEE best pumpkin cake with cream cheese frosting. And guess what? It was so good that the entire family ate it all before I could photograph it. So I am going to have to make it again just so you can have the awesome recipe as well. But FIRST. Let’s kick off pumpkin season with my all time fave…. 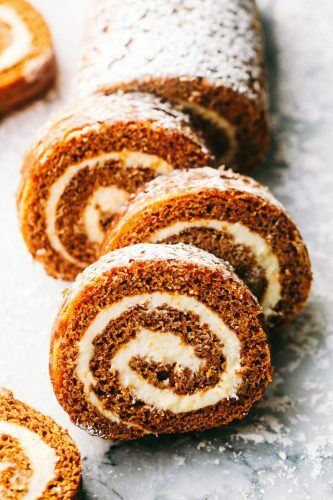 this pumpkin roll recipe. Don’t Be Scared! 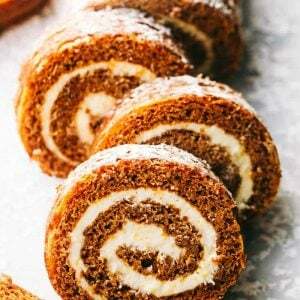 Pumpkin Rolls are Easy! I know a pumpkin roll can seem kind of intimating but they aren’t at all. If I can make a pumpkin roll, anyone can! I know that some methods of making a pumpkin roll include flipping it over on a dish towel with powdered sugar. But remember, we like EASY. So just keep the pumpkin roll on the parchment paper that it bakes on, and roll it up with that while it cools! Easy Peasy! Then when it is cool, simply unroll it, frost it, and roll it back up peeling the parchment paper off as you roll it. Here, let me show you how easy it is to make! 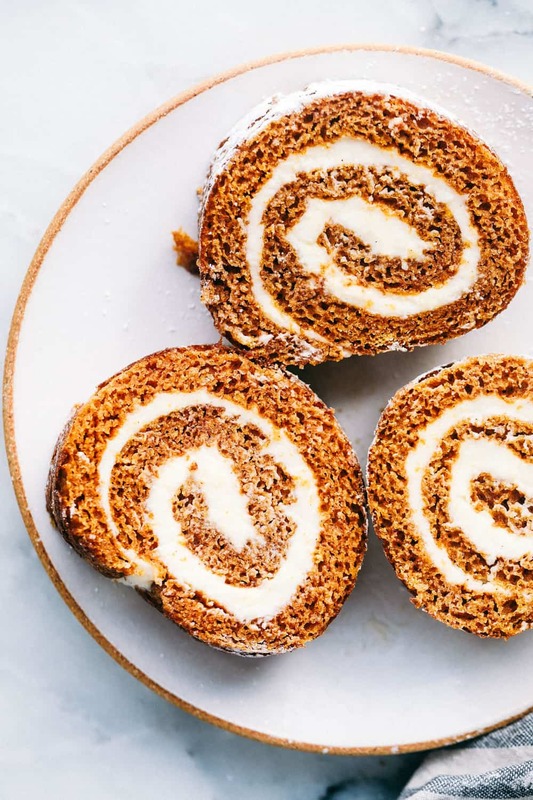 How do you make a pumpkin roll? Start by preheating your oven to 375 Degrees. 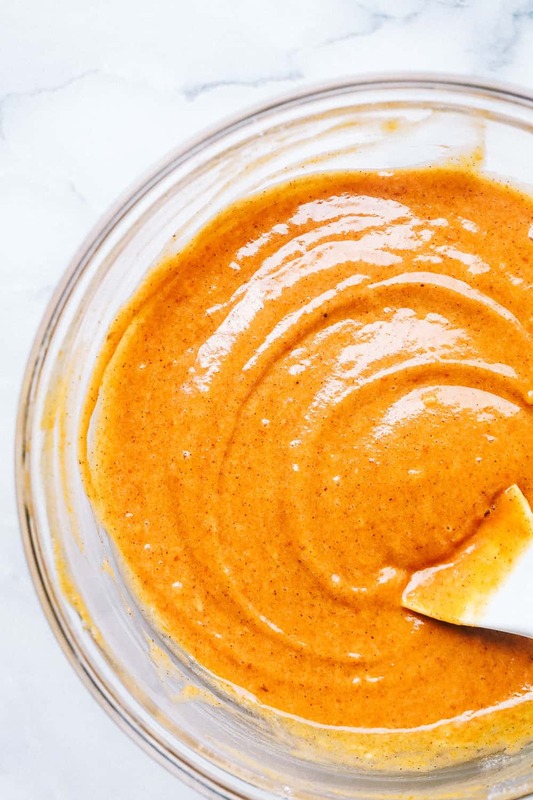 In a large mixing bowl beat your eggs, sugar, cinnamon, nutmeg, and pumpkin puree. In a separate mixing bowl, mix together flour and baking soda. Add slowly to the wet ingredients and combine until smooth. Line a 10×15 inch jelly roll pan with a sheet of parchment paper coming about 1 inch over the sides. Spread the mixture evenly on top of the parchment paper. Bake in the oven for 15-20 minutes. Remove from the oven and allow to cool just enough to touch. Lift the cake out of the pan. Starting from the short ends, gently roll up the pumpkin cake with the parchment paper inside. Allow to cool completely on a wire rack. Dust with powdered sugar and serve. Can store in the fridge up to three days. Line your jellyroll pan with parchment paper and leave a one inch overhang. This makes it easy for removal and rolling up your pumpkin roll. Use the parchment paper for rolling your pumpkin roll. Let it cool completely on a wire rack. When putting on the filling, leave an edge around the pumpkin cake so it doesn’t spill over when rolling it up. To get the perfect cut, I like to chill my pumpkin roll for at least an hour or over night. This lets the filling set and a clean cut every time. Dust your pumpkin roll with powdered sugar for the perfect finishing touch! How long will a pumpkin roll last in the fridge? A pumpkin roll will last up to three days in the refrigerator. Wrap the pumpkin roll tightly in plastic when storing. Can I freeze a pumpkin roll? Yes! 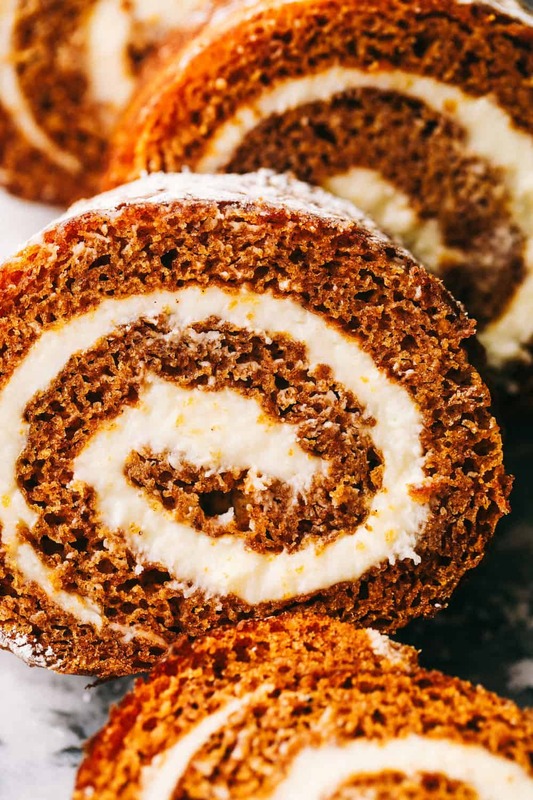 A pumpkin roll can be frozen for at least a month. When ready to use, thaw for about an hour before cutting. Preheat your oven to 375 Degrees. In a large mixing bowl beat your eggs, sugar, cinnamon, nutmeg, and pumpkin puree. In a separate mixing bowl, mix together flour and baking soda. Add slowly to the wet ingredients and combine until smooth. Once pumpkin roll is finished, I like to cover my pumpkin roll with plastic wrap and chill for at least an hour for cleaner cuts.